It looks like we are back to square one. 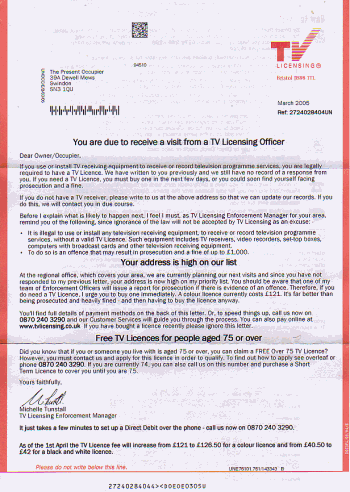 First of all it's back to the same old standard letters: You are due to receive a visit from a TV Licensing Officer . Erm, yes. I thought you had already authorised your Enforcement Officers back in December? Your address is high on our list . Well, it has been high on your list since October 2003, according to my math that's 1.5 years. Don't you think it's time you take some action then? But then the second point comes in: You seem to have forgotten my name. Ooops, how did that happen? Back in October you had managed to find out my name and were able to address me with Dear Mr Grewe . And now we're back to Dear Owner/Occupier ? October 2004: Turning up the heat? December 2004: Enforcers = Paper Tigers?